From my desk I can look over to my complete collection of Left Behind novels. On SpecFaith I’ve mentioned how I’m a recovering/current Left Behind series fan. 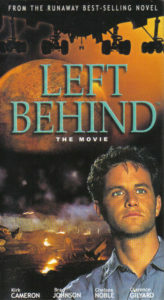 Today at Christ and Pop Culture I explore more about my pre-, mid-, and post-fandom, particularly the apocalyptic disaster that was the 2000 direct-to-video Left Behind movie (The One with Kirk Cameron). Alas, early expectations about a blockbuster-budget Left Behind film were slowly replaced by a more economical version made by Cloud Ten Pictures, e.g., the chaps who assembled direct-to-VHS end times movies advertised on Christian television. Well, Left Behind was bigger. Its budget was $4 million and that sounded expensive, right? Then in the summer of 2000, I saw Rexella Van Impe on TV gleefully cooing about a Left Behind: The Movie trailer (this one, I believe). The trailer was… well, it almost resembled the books, except with no visual effects. But then Rexella explained that you could get the videotape for a suggested donation. Wait, it was already on video? What about the theatrical release? 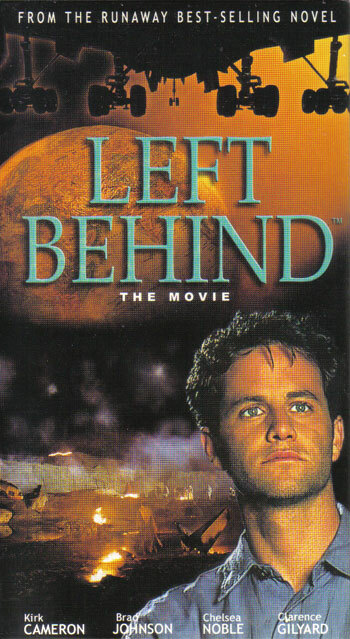 Yes, the makers planned to release Left Behind: The Movie first on VHS, then to theaters. But why would anyone attend the theatrical debut if they already owned the film on video? What “last days” madness was this? What were they thinking? Months passed before I bought a copy of the movie and saw for myself what they’d done. Read the rest at Looking Back at My “Left Behind” Fandom on Christ and Pop Culture. I never really got the Left Behind fandom. It’s an odd thing. The books aren’t really kitsch enough to like ironically, as opposed to the Thief in the Night series from Mark IV pictures. Yet they aren’t good enough to genuinely like; especially the movies. Maybe the audio drama and the spin offs were better, but it seemed like all that series did was give people like the Slacktivist ammo to use against us. I mean, I got the This Present Darkness fandom. For all its faults, Peretti delivered on a decent, creative story. But Left Behind seemed so soulless and corporate. DM, it appears you can’t help approaching the story “franchise” from the perspective of a “nerd.” That’s what’s chic now, but the Left Behind creators simply didn’t have that angle — despite the once-burgeoning fandom the series inspired. It would have helped the story. But as it was, I suggest that in retrospect the series didn’t feel as soulless and corporate as it felt evangelical — particularly the specific strain of evangelicalism that holds that All Of This Could Really Someday Happen. The nerd thing has a point, and I’m a lot nerdier than I was when the book came out. You do have to be careful in how you evaluate it, and it’s a danger to start evaluating Christian things from the position of nonbelievers. But I think I had these issues even back in the day when the books first came out. I wrote a post here on it. Sorry man, I get pretty down on Left Behind at the end. But I think that explains why I didn’t get into it, or get into Christian Rapture novels in general. From what I’ve read of the Slacktivist smackdowns, all the snark about gaping plot holes, wooden characterization, more than a little white ethnocentrism, and no clue about the importance of continuity is justified. Even reading it by proxy makes my brain hurt. … Then this is a plain lie. The series’ latter half in particular was crazy ethnically diverse. Only if one ridiculously equates “believes Christianity to be the only true faith” with “white ethnocentrism” could one consider the series to advocate “white ethnocentrism.” In fact the LB series was ahead of its time in this regard. What I meant by ethnocentrism is not that there are no brown people, just that LaJenkins (whichever of them) writes some thoughtless bunkus that it would probably take clueless white people to do. Like specifying that the Jewish people at the Wailing Wall were praying in Hebrew, because that gives the impression that LaJenkins finds the speaking of a foreign language even in its own country as unusual enough to be worth mentioning in particular. There’s scene-building, and then there’s whatever LaJenkins does, because they are just about as terrible at scenery as they are at character. There’s scene-building, and then there’s whatever LaJenkins does, because they are just about as terrible at scenery as they are at character. Agreed here, mainly because Jenkins’ (the main novelist’s) style is very sparse. Like specifying that the Jewish people at the Wailing Wall were praying in Hebrew, because that gives the impression that LaJenkins finds the speaking of a foreign language even in its own country as unusual enough to be worth mentioning in particular. But if that’s what the website said, this part here is how thoughtless “Harry Potter teaches children witchcraft”-style rumors get started. The only matching scene I can recall is in the second book, Tribulation Force, in which the main characters are present at the Wailing Wall to witness the fact that while a prophet is praying in Hebrew, the listeners around them miraculously hear his prayer in English. This isn’t simply an out-of-the-blue mindless detail that seems to over-exoticize them furreners. No, not that part — though it is pretty hilarious that Moses and Elijah are forced to speak only in KJV quotes for some pointless mystery — and wasn’t that in straight-up Shakespearean English and not miraculous translation? IIRC it’s from when Buck was dinking around Jerusalem between plot points somewhere. You might justly accuse me of nitpicking for that, because after all it isn’t as dumb as making the Jordan out to be a navigable river. I’m not sure how we can have a critical conversation about anything when we are entirely dependent on third party sources for information. I respect anyone who doesn’t like the Left Behind series. I personally enjoyed the first book, read the second one more to revisit some good times, and eventually gave up around the seventh or eight book as I remember. I remember I was puzzled later when it became the big movement amongst a lot of churches, since I’d read it mainly through the lens of fiction rather than prophecy. Still, while not liking or agreeing with a work of fiction is one thing, labeling it (and by proxy its fanbase) purely on hearsay is another. 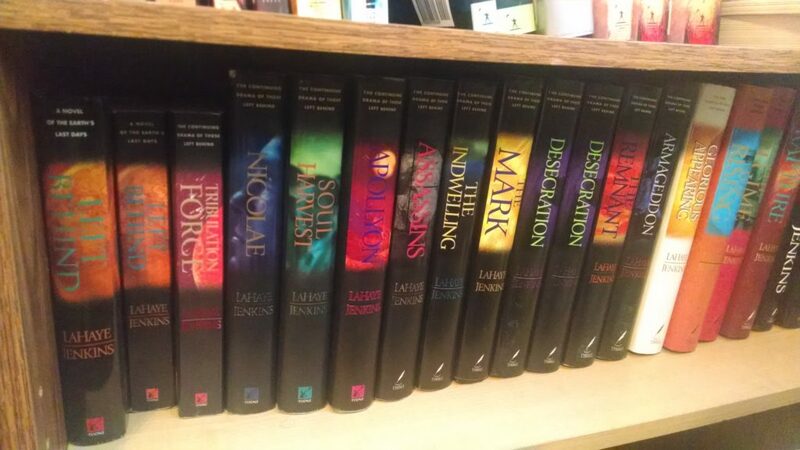 Honestly, most of what’s described as a detriment to the books (which, toward the end, veered in crazy directions) could be assigned to any large work that gets too big and unwieldy for its own good: Wheel of Time, the Star Wars Expanded Universe, Battlestar Galatica, even Harry Potter got iffy on some of the continuity toward the end. Agreed. And in fact, nitpicking such supposed ethnocentric “faults” is an act of crying wolf that makes Christians think they’re off the hook for legitimate criticism — just as Christians who cry “persecution” over the phrase “happy holidays” enable skeptics who feel free to ignore cases of actual persecution. I think though we need to have this conversation about the fanbase, even if feelings are hurt. I think in order to save feelings, we’re kind of allowing something worse to go on in the background; the narrowing and the stagnation of the Christian artistic world. And Left Behind had a huge role in playing with this. It’s not even so much about the art. Yeah it’s pretty bad, but if it were just that it would be okay. But the combination of a merchandising event with the Christian fanbase’s bad habit of choosing works to conform to culturally over their actual worth combined to form something which had far worse of an impact than you think. I’m not saying this to say Stephen is wrong in liking it; just ask me sometime about Chip N Dale Rescue Rangers to realize that I did the same thing as he did over something ridiculous too. I noticed a couple times you have a “keep the peace” mindset, but I think we’re at a point where we just can’t do this any more. I mean, we either police ourselves, or we get hostile people like the slacktivist doing it to discredit us. There’s a lot of stuff about Christian culture where we need to do this, as believers. Hmmm, I think one of the problems we have right now is that everything is IMPORTANT. If you like this book, it’s IMPORTANT. If you don’t like this movie, it’s IMPORTANT. If you support art, it’s IMPORTANT. If you support only Christian artists, that’s IMPORTANT. Personally, I think we could all stand to chill a bit on all ends. Let’s acknowledge that these are all works of fiction, that it’s OK to not like a book or movie or any other work of art without it being the end of the world as we know it (on either extreme). If we could do that, I think we’d all be happier and the art would actually be improve (as opposed to living in the stranglehold of needing to lift the entire cultural landscape up to whatever notch it is we’re aiming for). Left Behind was a fad that spawned a lot of other fads in evangelical cultural, some good, some not so much. I think that’s what Stephen meant in his post. He remembers it fondly but is able to acknowledge its flaws (at least that’s what I got, feel free to correct me Stephen). I’d say what he’s suggesting is that we learn from the past and move onwards and upwards toward greater things. Left Behind was a fad that spawned a lot of other fads in evangelical cultural, some good, some not so much. I think that’s what Stephen meant in his post. He remembers it fondly but is able to acknowledge its flaws (at least that’s what I got, feel free to correct me Stephen). In the CAPC article I compare the series to Teenage Mutant Ninja Turtles. The late ’80s/early ’90s fad was about a franchise whose premise was the very pinnacle of popular-culture corporate franchising — and that continues to this very day. But it doesn’t mean it’s either Vastly Important to Support This Thing any more than it’s Vastly Important to Be a Hater.